This photo shows Newark Penn Station during a recent snowstorm. This photo shows Old Short Hills Park in Millburn Township. This photo shows the Short Hills Train Station. Orange, New Jersey: Another new transit-oriented-development could be coming to Orange. The City of Orange Township will host a public meeting tonight regarding a proposal for a new six-story development at 258 Reock Street, between South Day Street and South Center Street. According to the City, the building is slated to contain 102 mixed-income residential units, and would be developed by L+M Development Partners, the company responsible for projects like 50 & 55 South Essex in Orange and the redevelopment of Newark's Hahne and Company and New Jersey Bell buildings. The City is considering the authorization a financial agreement with L+M, according to a notice. 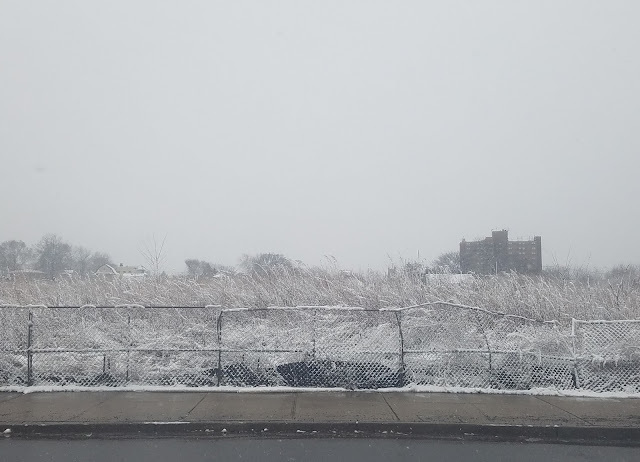 Currently, the property, which is located near the main Orange Train Station, the Main Street and South Essex Avenue business districts, and Coach USA and NJ Transit bus service, contains a gated vacant lot that previously was the site of houses. Since 2012, part of the lot at 258 Reock Street has been owned by Reock Urban Renewal, LLC, which is registered out of the same Westchester County, New York office as L+M. The community meeting will be held at the Le Parc Place preschool within one of L+M's local buildings at 50 South Essex Avenue, from 6:00pm to 7:30pm. This photo shows the border between Newark's West Ward and South Orange. This photo shows an entrance to South Orange's Tuxedo Park neighborhood along South Orange Avenue. This photo shows the East Branch of the Rahway River in South Orange. This photo shows icicles at the Short Hills Train Station. This photo shows Downtown South Orange businesses and Village Hall with the Newstead neighborhood up the hill in the distance. This photo shows the Cora Hartshorn Arboretum and Bird Sanctuary in Short Hills. East Orange, New Jersey: A new restaurant with a name similar to a nationwide fast casual franchise has opened in Essex County. Chipot Lee, which appears to have no relation to Chipotle, opened its doors last month at 462 Central Avenue, between South Clinton Street and South Burnett Street, in East Orange. The restaurant advertises itself as a 'Mexican and Asian grill', and menu items range from General Tso's chicken, fried shrimp, and cilantro white rice to chicken burritos, tacos, and chips with guacamole. The business is open for lunch and dinner daily except for Sundays. The space, located next to Scovil's Barber Shop, was previously occupied by a location of Crown Fried Chicken and Pizza. Newark, New Jersey: A new business has opened in Newark. A restaurant called Digi Cafe is celebrating its grand opening at 1017 South Orange Avenue, between Smith Street and Telford Street, in the main business district of the Vailsburg neighborhood in the West Ward. The business promotes itself as the 'home of authentic Jamaican cuisine', and serves beef patties, chicken patties, and other items. The space was previously occupied by a Rita's Italian Ice location and a store called Beauty in the City. This photo shows Grove Park in South Orange. These photos show Greenwood Gardens in Short Hills. Newark, New Jersey: A lot on the border of Newark's West Ward and Irvington that has been vacant for close to a decade could soon see new use. Carmelo G. Garcia, the Executive Vice President and Chief Real Estate Officer of Newark Community Economic Development Corporation (Newark CEDC), told Essex County Place exclusively that a polytrauma center is being proposed for the lot at 552-572 South Orange Avenue, located just east of the Garden State Parkway at the corner of Grove Street. The center, which would include housing for veterans and potentially assisted living, would rise where the Pabst Blue Ribbon Brewery and the Hoffman soda factory stood for over 75 years. The complex, which was known for a water tower atop the plant that was designed to look like a bottle, was demolished in 2008. In the years since, Grove Street which runs down the middle of the property, has been moved further east, and the lot has been vacant and gated. Then, at the end of 2015, the Newark CEDC issued a request for proposals seeking developments that would "enhance the quality of life for Newark residents, create employee opportunities for Newark residents, (and) generate new tax revenue for the City." Now, although there were multiple plans for the site, including one posted by Inglese Architecture and Engineering for a mixed-use community with 200 residential units and 20,000 square feet of retail space, it appears that such a development has been found. Garcia stated that the project, which could create close to 1,000 jobs, "would breathe more life into the West Ward," explaining that existing businesses in the area would benefit from the increase in customer traffic. The center would be contracted by the Veterans Administration to a private operator, according to Garcia, who said that it would create "phenomenal" tax revenue for the City. Before any construction can begin, Garcia says that there is currently a due diligence period, and that the site will require remediation. Cleanup of the property could take around six months, according to Garcia, who stated that Pabst Blue Ribbon would be responsible for handling the removal of underground contamination or soil contamination. "This is incredible and historic for Newark," Garcia said, adding that "we are, by far, leading, in the state of New Jersey in the area of converting brownfields or blighted and dormant vacant land into really productive uses, which is really unheard of at the pace that we're doing it." This photo was taken along Sloan Street in South Orange, and shows the historic South Orange Fire House. This photo shows City Hall in Downtown Newark. Newark, New Jersey: Changes could be coming to a Newark bridge that is crossed over or under by thousands of commuters daily. According to a legal notice, the City of Newark, the North Jersey Transportation Planning Authority (NJTPA), the New Jersey Department of Transportation, and the Federal Highway Administration are conducting a Local Concept Development Study regarding the bridge that carries Central Avenue over the Newark Light Rail at the corner of Hudson Street, just west of the Norfolk Street Station. The bridge reportedly dates to 1908, and originally crossed over the Morris Canal, which was later drained and converted into the Newark City Subway, known today as the Newark Light Rail. As the structure nears 110 years of serving Newarkers, officials are seeking residents' input regarding its future. A website created regarding the study, CentralAvenueBridge.com, states that that bridge "is experiencing a number of simultaneous and pressing safety concerns due to degraded and obsolete infrastructure," and that the "most recent Bridge Re-Evaluation Report identified a number of safety concerns related to the deck, superstructure and substructure of the bridge," rating its condition as serious and its physical condition to be poor. Because of this, several possible options for addressing these concerns, including "a 'no-build' or 'do nothing' alternative," a "major rehabilitation of the bridge," and "bridge replacement" will be studied. A public meeting and presentation will be held on Monday, March 20th from 4:00pm to 7:00pm in Room 240 of the New Jersey Institute of Technology's Campus Center, located at 154 Summit Street, in order to gather public input and provide information, according to the NJTPA. An online survey has also been created to gather community input. Studies are also being conducted regarding the Bridge Street Bridge connecting Newark with Harrison, Hudson County and the Kingsland Avenue Bridge connecting Nutley with Lyndhurst, Bergen County. Fairfield, New Jersey: A new business has opened its doors in northwestern Essex County. A grand opening celebration will be held this Saturday, March 18th for Zest, located at 16 Little Falls Road, between Fairfield Court and Passaic Avenue, in Fairfield. The business, which opened earlier this month, is now open daily, and is owned by Luciana Contuzzi. According to its website, Zest serves gluten free and dairy free items, including smoothies, muffins, juices, acai bowls, and salads. The space, located next to Carmella Ice Cream, was previously occupied by Jacky's Nail Salon and Silk Nail. The Vesey Street Commons development is slated to rise at the site of this vacant lot in Newark's East Ward. Newark, New Jersey: Several upcoming development projects in Newark could be receiving federal funds. According to legal notices, the City of Newark will be submitting requests to the United States Department of Housing and Urban Development (HUD) on or about March 23rd for funding for projects in the South, West, and East Wards. The City is seeking $300,000 in HOME program funds to be granted to GonSosa Development in partnership with the Blue Sugar Corporation for the Rita Gardens project, which, as Essex County Place first reported last year, will be developed in part by Essex County native Queen Latifah at 650-656 Springfield Avenue in the South Ward. One of the project's buildings will contain 59 units of affordable housing, and five units will be reserved for residents experiencing homelessness. Supportive services will be provided by an experienced non-profit social service provider, a notice states. According to HUD, "HOME is the largest Federal block grant to state and local governments designed exclusively to create affordable housing for low-income households." In the West Ward, the project to turn the long abandoned Hospital for Women and Children at 536-540 Central Avenue into a mixed-use development could also receive funding. Developer Bryant Park Urban Renewal, LLC is slated to turn the century-old structure into 23 affordable residential rental units and four retail spaces. Now, PrimeLerner Companies could receive $894,204.67 in Section 108 loan guarantee funds, described by HUD as "one of the most potent and important public investment tools that HUD offers to state and local governments." The project is also slated to receive a 15-year tax abatement from the City. Lastly, in Downtown Newark, the upcoming 23-story One Riverview development, also known as One Rector Street, at the southwest corner of McCarter Highway/Route 21 and Rector Street, could receive $2,900,000 in Section 108 loan guarantee funds. Former basketball player and Newark native Shaquille O'Neal is involved in the project, but Boraie Development, AECOM and Perkins Eastman would receive the funds to be used in the development of the building's 168 residential units and two retail spaces, according to a notice. Boraie's website states that the building's units will be market rate. One Riverview will be built at the site of the former Science High School and Ballantine Brewery. Although the project renderings showed that the new development would be built around the historic structure's facade, and developer Wasseem Boraie told The New York Times that doing so "would make for the 'dramatic metaphor' of a sleek modern tower rising from a historic brick foundation wall," the building was demolished earlier this year. City documents show that Newark Landmarks and Historic Preservation Commission Chairman Richard Partyka stated during a February meeting that the demolition did not have the proper permits, and that the commissioners "expressed concern," requesting that a stop work order be issued. HUD's Newark area office at One Newark Center will accept written statements from residents regarding the proposed grants during the ongoing 15 day comment period. Newark, New Jersey: A new restaurant that specializes in vegan cuisine has come to Newark. Blueberry Café Juice Bar and Vegan Grille opened earlier this winter at 547 Central Avenue, between South 10th Street and South 11th Street, in the Fairmount neighborhood of the West Ward. The business, which is open daily, states on its website that it was founded because of "the desire to bring healthier food options to urban communities." Menu items include teas, cold press juices, smoothies, smoothie bowls, vegetable soups, salads, wraps, and cookies. The space was previously occupied by Doobies Plaits & Twist Unisex II and All Star Barber Shop, which has since moved a few blocks east. This photo shows the Adapt Studios, located in a former coat factory in Newark's Ironbound. Signs of the industrial history of Newark's Ironbound remain throughout the neighborhood, including this building along New Jersey Railroad Avenue. Newark, New Jersey: A new residential development is planned for the southern gateway to Downtown Newark. According to a legal notice, a five-story building could come to 1213-1221 Broad Street and neighboring 124 Miller Street in Newark's East Ward. The notice states that Fausto Simoes, a managing member of New Broad Street, LLC, is seeking preliminary and final site plan approval with variances to construct a 72-unit building with parking on the ground floor. Each of the upper four floors would contain 18 units. Currently, a three-story house and Souly Motor Cars, a used car dealership, are located on the property, but both buildings are slated to be demolished to make way for the new development. The site, which was previously home to Broad Motor Car and Andy's Transport, Inc., is situated across the street from the Broad Street off-ramp from Route 21/McCarter Highway and a vacant PSE&G building. There is NJ Transit bus service to Elizabeth, Newark Liberty International Airport, Downtown Newark, Midtown Manhattan, Middlesex County, Monmouth County, and Ocean County within walking distance of the property. The Newark Zoning Board of Adjustment will hear the proposal during its meeting on Thursday, March 23rd at 7:00pm in the City Hall Municipal Council Chamber. Newark, New Jersey: Several abandoned or vacant properties in Newark's East Ward could soon see new use. A resolution will be introduced to the Newark Municipal Council during its meeting this Wednesday, March 15 at 6:30pm that calls for selling three lots that are owned by the City of Newark to All Renovation Construction, LLC, which is based in Manhattan's Harlem neighborhood. The properties, located at 29-31 Astor Street, 33-35 Astor Street, and 35 Murray Street, consist of a parking lot, the historic but abandoned Engine 10 firehouse, which dates to 1874, according to 1st Responder News, and a vacant wooded tract. The City is planning to sell the lots for a $43,649.72, according to the resolution, which states that the properties "are no longer needed for public use." City records show that All Renovation Construction sent a letter of intent to purchase and redevelop the properties, and is now planning to rehabilitate the properties "to create a kitchen incubator." Although there are currently none in Newark, there has been a growth in the number of kitchen incubators in recent years across the country. According to NPR, "incubators can help hungry entrepreneurs get started in a licensed kitchen at a fraction of the price of leasing their own space," while offering "business support and technical assistance...to help 'foodpreneurs' get off the ground." Additional details regarding the Newark incubator have not yet been released. A 79-unit development is planned for this site at 18-26 New York Avenue in Newark's East Ward. This photo shows the wall along New Jersey Railroad Avenue in Newark's East Ward, along with Newark Penn Station, the Dock Bridge, and the trestle that will soon carry visitors to the Mulberry Commons park. This stone slab advertising Lun On Co. that sits along Mulberry Street is one of the last remnants of Newark's Chinatown neighborhood, according to Newark Happening. What once was a neighborhood now largely contains parking lots. Currently, just south of Newark Penn Station is the end of the line for PATH's Newark-WTC route, but plans for an extension to the Newark Liberty International Airport Rail Station are moving forward. When the surface parking lot adjacent to the Newark Warehouse Company Building closes to make way for Mulberry Commons, it is slated to be replaced with a new lot at this neighboring tract, according to a legal notice. Newark, New Jersey: In the years since an international bank closed its Essex County locations, all of those spaces once occupied by the bank have remained unoccupied. Now, a branch of another bank is coming to one of those spaces in Newark's East Ward. Chase Bank is planning to open a new location at 151 Ferry Street, at the southwest corner of Adams Street, in heart of the Ironbound neighborhood's main business district. The Midtown Manhattan-based company's website does not state when the ribbon will be cut for the new branch, but mentions that it will be open from 9:00am to 5:00pm on weekdays and from 9:00am to 2:00pm on Saturdays. Chase currently has two locations just blocks from each other along Broad Street in Downtown Newark, but neither of them is open on Saturdays. The space, located on the ground floor of a three-story building below a salon, has been vacant for over five years. It was previously occupied by an HSBC branch, which closed in 2011 when the British company shut down over a dozen regional locations, including all of its Essex County locations. The spaces once occupied by HSBC in Millburn and West Caldwell remain vacant. This part of Newark's Prudential Center along Mulberry Street will be home to the first GRAMMY Museum Experience in the Northeast this fall. These photos show the Newark Warehouse Company Building, also known as the Central Graphic Arts Building, which is becoming the Ironside Newark development. This photo shows the historic Firemen's Insurance Company Building in Newark. This photo shows the historic main post office in Downtown Newark. This 'ghost sign' on Broad Street in Downtown Newark advertising radios, television, and washers is a sign of the city's past. This photo was taken in Newark's Ironbound neighborhood. This photo shows the former East Ward Industrial Complex, which is being transformed into the Textile Lofts development. UPDATE 3/2/17: According to Lonnie Soury, who represents the RBH Group, the company is finalizing a transaction with Aldo Sartore of ITA Concepts, who is "the co-founder of the Eataly vision", "to locate a 10,000 square foot 'first-of-its-kind' Italian-inspired fresh food marketplace in Teachers Village". However, although the Newark Community Economic Development Corporation's Chief Real Estate Officer tells Essex County Place that it will be an Eataly location, according to Soury, the marketplace will not have the Eataly name. "We look forward to welcoming this innovative concept to Teachers Village and the burgeoning Newark restaurant scene," said Soury, adding that it is expected to open towards the end of 2017 or the beginning of 2018. In a statement, Brianna Buford of Eataly told Essex County Place that "while Eataly is always looking to expand into new markets, there are currently no plans to open in Newark, NJ", and that there is not a connection between Eataly and the upcoming Newark marketplace. Newark, New Jersey: A popular chain of Italian marketplaces is reportedly planning to open its first New Jersey location in Essex County. Carmelo G. Garcia, the Executive Vice President and Chief Real Estate Officer of the Newark Community Economic Development Corporation, told Essex County Place that Eataly will open a market and restaurant within the new Teachers Village mixed-use residential, retail, and educational community along Halsey Street in Downtown Newark. According to Garcia, a lease has been executed between Eataly and the RBH Group for a 15,000 square foot location, which is set to become the anchor tenant at Teachers Village. "It's not any more that Newark is on the rise, I think Newark is now soaring," said Garcia. Eataly currently has dozens of locations worldwide, including in Brazil, Germany, Italy, Turkey, Qatar, South Korea, the United Arab Emerates, and the United States. There are American markets in Downtown Manhattan, Manhattan's Flatiron District, Chicago, and Boston, and a location is also planned for Los Angeles. Essex County Place has reached out to Eataly for comment and this article will be updated should the company respond, and as more details become available. Whole Foods Market's Newark location will open today within the Hahne and Company Building in Downtown.